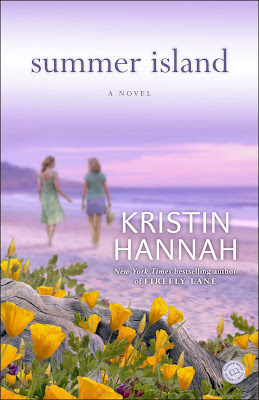 Here's the new cover for Summer Island. This is the mother/daughter book that started it all for me. What do you think of the cover? It's coming out June 1st! That's a beautiful cover! As artistic as your blog photos are it's conceivable you did this cover yourself. Did you? With this, I was inspired to check on just how many books you've written. Wow, I've got a LOT to look forward to! In fact, I think you may write faster than I read, so if I only had your collection to keep me busy, I would be (busy). What a lovely vocation--to actually experience a measure of success from each accomplishment. i.e., acceptance by the publisher, sales, reviews, & comments from we readers here on the blog, that may not reflect in sales for those of us who are library and used book audiences. Sure makes me wish I'd been good at it myself! I was NOT good at it at the beginning. Like so many things in life, it took years of hard work to be an overnight "success." I feel really blessed and grateful that I was able to keep trying for so long. Thanks so much for reading so many of the books and I'm glad to be your "go to" author! Do you feel that your first (however many) books were not that good...I mean the published ones? The earliest I've read of your books was Once in Every Life. For you, is Summer Island your first 'real' book and maybe the rest starter books? Gorgeous cover for an absolutely FABULOUS book!!!!! So pretty! I got a free copy of this book from the publisher as some promotion. Well, technically, the free book went to my mom. Beautiful cover. Wasn't the book that started it all for me though. I was already a long-time fan at that point. Love the new cover as it will grab new readers and that is good. But, the original hardback book and cover still holds many sentimental memories for me. It's 2:04 am PT - and I just finished Firefly Lane. I have a tendency to stick with the same authors over and over again. But, while at Target last night, I started to crush on your title and cover artwork - so I took a chance. I started it this morning and put it down only once - to feed the family. I finished the last few chapters soaking in a hot tub; mascara running down my face. Not from the suds or the steam; instead, the tears were from your story. My husband started to worry. Really. I was born in 1976, so I didn't live through what your characters did during the first bit of the book; but I loved reading about the 80s, 90s and 2Ks. The story was beautiful; simply amazing. I am a fan and cannot wait to purchase the rest of your books; past and future. P.S You owe me a box of Kleenex. P.S.S. I want to write a story like that one day. P.S.S.S. My edition of Firefly Lane will be visiting my own mom this weekend; I think she will love Katie Scarlett and Tully as much as I do. I actually just lent Winter Garden to a co-worker. She likes it so far and expects to finish it this weekend. If she likes it, I'll lend her others. I finished The Girl with the Dragon Tattoo and I'm onto The Girl who Played with Fire. I'm enjoying the series so far. I see on your blog (love the Little Miss pix, btw) that you read some of your books on the Nook. Can you tell me how you chose the Nook over Kindle? I think it would be fun to have an ereader (but wouldn't totally replace books for me..just a fun gadget). As an aside, I find it quite funny that B&N chose the name Nook for their reader. In the Seuss book One Fish Two Fish, Red Fish, Blue Fish, the character identified as a Nook is actually illiterate. That's funny, Lynn (Nook). I think that's the ever present challenge for marketers---finding terms that don't strike the wrong cord with anyone--I'm sure they were trying to subliminally suggest a special place, like a breakfast or reading nook. Once when I was trying to think of a good business name for myself, if I was going to expand on my photography, and asked Dad what he thought of "The Attic Window". He warned I might want to steer clear of referencing Microsoft. Oh yeah, hah? So, besides reading good books and this fun blog, does anyone else follow other blogs? I only have one that I was following closely; Jessica Watson's. She was the Australian 16 year old sailor who circumnavigated the globe. You may have been hearing about Abby recently--the 16 year old Californian who needed rescuing from the Indian ocean (hope everything is going well with that--I have not heard today)...I read her blog a little and the Navy fellow's from India who was also sailing around the world, but only Jessica's held my attention. Even though you would think every day might be pretty similar--ocean, sky, boat wind, she kept each post interesting. I admit that the "real time" aspect was a factor in keeping it interesting. Well, off I go for now. You are my favorite writer. I discovered you in January when I bought Firefly Lane in paperback. Since then I've read True Colors, Winter Garden, Between Sisters, and I'm almost done with Mystic Lake. I tell everyone I know about you and your books. The way you write captivates me and leaves me wanting more. I can't wait to find out what Annie decides to do. Thanks again. I plan to read all of your works. Lynn, I did a bit of research. I chose the nook because I shop mostly at B&N. I also liked the idea if I had a question, I could go into the store. The final reason is that I had enough gift cards that the nook was no cost to me. :) I like it a lot though. Thanks for the nice words about Little Miss. Tracie, I follow this blog, The Pioneer Woman, The Cooking Photographer, a few authors and a few friends. I finished The Girl with the Dragon Tattoo and started The Girl who Played with Fire, but I'm putting it aside so it'll be fresh for next month's book club. So, I'm reading The Passage right now to see what all the fuss is about. Ever since asking that question about anyone else reading other blogs I've been a bit anxious, but was concerned about becoming the sole speaker on Kristin's blog here, so I resisted posting again right away. But asking if anyone *reads* any good blogs might have sounded like I thought that no one here was WRITING a good blog. Not so! Not so! With all the talk about how cute little Miss is, and how fast she is growing in an earlier post, I did peek in on yours, April, and saw the adorable pictures! Little Miss *is* a doll, but I also love the one where your smile was so big you had a funny comment on your cheeks and eyes! I am totally loving "The House of Seven Gables", but your titles, April, look compelling and now I'm envious that I'm not there yet...so Passage is out? Shoot, and me still not having read Winter Garden. I feel like that man in ...oh, this is probably before your time...but an episode of "The Twilight Zone" where a bookish fellow is constantly trying to find time to read but never can. When suddenly, he finally has nothing *but* time to read (the world ends and he's the sole survivor or some such thing---[we're talking black and white here, so it HAS been awhile since I saw it]), his glasses fall to the ground and crack (so he's faced with an eternity of nothing to do but stare blindly at all the books he longs to read). Oh, my goodness, Tracie! My mom and I are HUGE Twilight Zone fans. I think we've seen all of them. That's her favorite episode. I believe it was Burgess Meredith, but I could be very wrong. Yes, The Passage is out. I like the way it's written, but I haven't gotten very far yet. Justin Cronin is coming to town next week, and I'm going to try to check it out. I have a rather large list of books to read. This is a slow month, too. I've only really read one book and having trouble focusing to finish others though I've started many. Hee-heee! OMG April, you're right! It was Burgess. I think of him as an older fellow but I Googled him and found this wikipedia entry--- for "Time Enough at Last" http://en.wikipedia.org/wiki/Time_Enough_at_Last ! How fun that you and your Mom watched Twilight. My favorite Mom-and-me- with-a-bag-of-chocolate-"Kisses"- between-us series was "Thriller" (not Michael Jackson) which, if I remember right, was a different scary movie each week. "Outer Limits" was OK but not nearly as good as those two...and then later, like the 70's I got hooked on one called, "One Step Beyond". They were probably actually re-runs since they too were black and white, but somehow I'd missed it when it first came out. The best friend that used to watch it with me on sleep-overs ran into a DVD of the series a couple of years ago and sent it to me for Christmas. Sorry if I'm putting folks to sleep. Thanks for the blog suggestion Lynn. So, Kristin is occupied with writing her next book right now, right? There have been some Kristin Hannah topics for discussion on her Facebook page if you are on Facebook. There was a casting topic and another one. I forget because I didn't participate. Tracie, I didn't watch a lot of scary things. I liked more the twists at the end though I watched a bit of the Amazing Stories. My mom and I mostly watched the cheesy. Twilight Zone marathons were saved for New Year's Eve or Fourth of July. We still talk about the show often. Plus, we watched because the episode To Serve Man scared my dad and gave him nightmares so we would always tell him it was on so he'd leave the room. :) Aliens were spoiling humans to write this book until the humans found out it was a cookbook. To Save Man is one of my all time favorites.The humans thought they were being taken to the alien planet to live a life of utopia and be 'served' by the aliens. I completely laughed my head off at that line at the end. Once they cracked the language code, one exclaims "To Serve Man....it's a cookbook!!" cue music duh duh duh DUH. Having said that, I have seen other alien things that scared me pretty badly and did not strike my funny bone. Absolutly fabulous cover! I'm going to have to pick that up. At the moment I've been reading True Colors and I regret ever time I put it down! I love it! The problem is that I just recently started my vacation and my six year old cousin i'd with us and I have to entertain him so I have trouble finding time that I can just sit down and read. My mom finished The Things We Do For Love befoe I left and she didn't stop crying, I'm reading that when I get back for sure. So last week I checked the "Leatherby Library" where I am doing the Summer Reading program and yes, they DO have "Winter Garden" but it says it is due June 6th. "Hmmmm" thinks I, "Didn't we already have June 6th this year? So yeah, it's overdue, but it *could* be back when I'm ready to read it." April and Lynn, yes, I saw "To Serve Man" a number of times. That was a good episode too. I realized in re-reading my message that I shouldn't have referred to "Twilight *Zone*" as just "Twilight", since that is now a popular book title that has nothing to do with the old series. Sorry if I confused anyone! April, I guess I did sound like a "scary movie" enthusiast. Not that there's anything wrong with liking scary plots, but I actually don't consider myself a fan of "scary". "Thriller" was hosted by Boris Karloff, who was just cool to watch and I don't recall being particularly scared by the movies. (I like suspense, but not horror) I mostly loved the huge mansion like houses with secret dark corridors and the lovely brave maidens in beautiful long gossamer gowns (who I wanted to be like when I grew up---Sadly, that didn't happen) who tentatively passed through them, with flickering candelabras (in other words, I loved great costumes, scenes and lighting). "One Step Beyond" was not scary either, except I guess for those who fear the paranormal. It was usually about some sort of evidence or strange occurrences suggestive of the lingering presence of the recently departed. Erin, SWEET! A six week vacation? That's good of you to entertain your cousin instead of relaxing. You've made me anxious to get to my copy of "True Colors". That one will have to wait for me though. I just saw that Angel Falls is coming to ebook soon. I didn't preorder, but I'm totally buying it when it's released. It's one of my favorites and one I reread often. Can't wait to reread this summer! 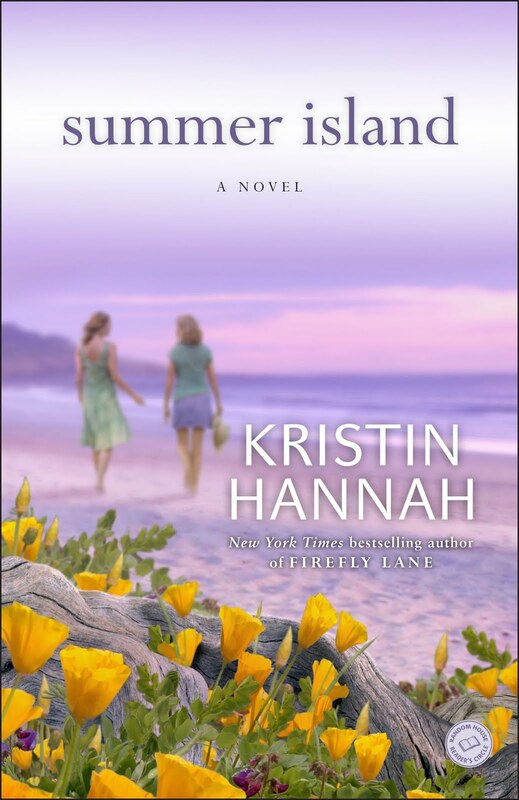 I just bought "Summer Island" this weekend and will be reading once I finish "The Girl Who Played With Fire". Love the cover, the beach and flowers. And Kristin you have become my "go to" author. Summer Island is my life to a T. I am not on the radio giving out advice, but I do talk to a lot of people about seeing things from the outside and give them insight to how others may see things differently. My daughter and I have the same "exact" relationship as Nora and Ruby. The first time I heard her say "I hate my Mom" was in her sleep.....it crushed me. She is 14 and lives with her dad. She thinks she doesn't need me in her life because she has a stepmom and puts her dad on a pedastal. She blames me for everything. I have to understand that she is young. I have gotten through "losing" my daughter for now until she is older through a lot of soul searching and realizing that she is too young to "understand" what I went through. Ironically, she called me as soon as I was done with this book, telling me how much she missed me and thought she could live without me in her life, but recently realized she can't. There is a lot of healing that needs to be done, but I plan on giving her your book to read to help her relate or understand why I did the things I did, and that time is too precious to let things continue the way they are. I don't know what will happen, but I hope they end the way Nora and Ruby's did with my daughter saying "I love my mom" in the end. Thank you, sincerely, for writing a book that may help both of us heal. I had been hoping (or wishing) there was a book that related to my situation. I can't believe I actually found it. This is the first book of your that I've read and I picked it because of the cover. Proof that by putting out the thought, the energy will bring it back to you. I had also wished that my daughter would call me after reading this so I could send it to her, and that happened as well. So on that note, wish me luck! Just finished this book on my Vegas vacation. Loved it!